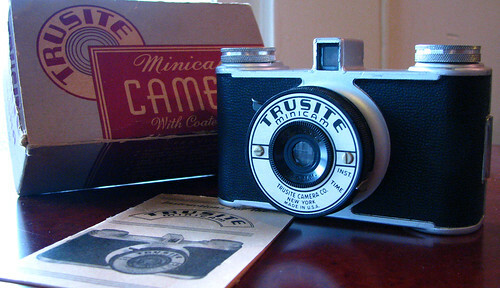 Trusite Camera Co. of New York City produced a few simple models, all for 127 film, during the 1940s. The lens/shutter assembly seems quite similar to that used on the Utility Manufacturing Company cameras (also from New York). As with many other models dubbed "minicam," this is a model for half-frame 127 format—in other words, images approximately 3×4 cm, achieved by advancing each number on the film's backing paper to a first, then a second red window on the back. The Trusite Minicam is a simple affair with a fixed focus 50mm meniscus lens and an instant/time shutter. The body is cast metal. In 1947, a kit with the camera, a flashgun, and four flashbulbs sold for $9.95. A version with Girl Scout branding is also known. McKeown also shows a boxy Trusite model giving square images on 127 film, calling it "very uncommon." ↑ Trusite advertisement in the December 1947 Popular Photography (Vol. 21, No. 6), page 223. ↑ McKeown, James M. and Joan C. McKeown's Price Guide to Antique and Classic Cameras, 12th Edition, 2005-2006. USA, Centennial Photo Service, 2004. ISBN 0-931838-40-1 (hardcover). ISBN 0-931838-41-X (softcover). Page 934. This page was last edited on 3 July 2017, at 05:34.